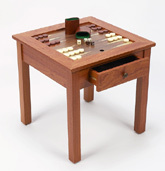 As beautiful as this Oriental Game Table is it is also equally functional! 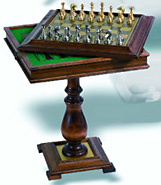 Has an interchangeable playing surface that can acoomodate a game of chess, backgammon or checkers. An included matching wood panel can covers the board surface so the table can conveniently be used as an end table. This Table also includes a storage drawer for all your game pieces. The table is 19.5" inches tall and 19" x 19" width. This features of this game table make it a great buy and is one of our best selling items! You will be pleased. TA021-9023. Four In One Combination Table Set With A Practical Foldaway Design. Featuring a large variety of gaming options, this fabolouse combination set satisfies even the most demanding game enthusiasts. Choose from nine different games all combined into one extraordinary set. The set includes chess, checkers, backgammon, cribbage, tic tac toe, straight mill, craps, roulette, and black jack. (all game pieces are included ). This set has it all and is being offered at a great price! This Italian solid wood pedestal chess table features beautiful squares that are inlaid with the finest maple and walnut woods. The table also features a beautiful mosaic inlaid border that is an addition to the uniqueness of this furniture piece. This Game table is a beautiful decorative centerpiece that is welcome in any room of your home for you and others to admire. Table height is 27”inches, the width is 16” and the squares are 17/16”. This elegant Italian wooden game table is crafted of solid hardwood featuring a beautiful mahogony finish coupled with brass. This rich and exquite table acts as a perfect centerpiece to any game room. 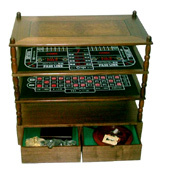 The table features a silk screened backgammon board for additional gaming options. This game table also has a storage partition for all your game pieces located just underneathe the backgammon playing surface. A well-designed, stylish gaming table at an unbelievable price! You will absolutely love playing checkers or chess on this luxurious table. The Fide game table is imported directly from Poland where is manufactured by the best artisans from Biasov chess tables. This chess table features a wonderful combination of functionality and form, it features a removable top that when is flipped over shows a standard wood finish that makes it look like a furniture piece. This chess table is made from beech wood and natural veneer and it has been finished with a water resistant lacquers. 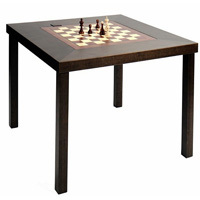 The table measures 28” tall with a chess board that measures 35” x 35” and 2- 2/4” squares. Chess pieces are not included. Hand Crafted in Italy, this unique pedestal chess table is a work of art. 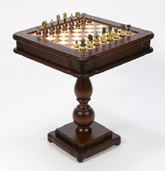 The table is inlaid with the finest Italian alabaster, made out of solid wood, and features two convenient drawers for storage of your chess and checkers game pieces. The measurements are 23 ½” Width x 27 3/8” Height. Squares measure: 2 1/2". TA014-400. Walnut & Mahogany Italian Three in One Game Table. Pictures cannot describe how stunninly rich this table is in person. Hand crafted in Italy, this prestigious walnut & mahogany pedestal chess table is a true work of art. It combines three games in one: Chess, Backgammon & Checkers. The chess table top can be removed which exposes an interior compartment for safe storage of your game pieces.